First, let me assert this: There is NO such thing as “purity and sanctity” of a customer review of a business. Of ANY business, dealership or not. Why? For any review "collector" (Google, etc. ), trying to police reviews while thinking otherwise is Pollyannaish and is really an enormous “plate of spaghetti” (whether the reviews were performed on the business’ property or off)—because either, or both, the business and the customer may have agendas that bear little on the actual experience and more on their personal and/or business reasons. And that’s assuming the review came from a real customer—as both businesses and individuals can “game” any system of reviews, and they will. So, again, whether the reviews are done on or off property of the business does not change that. And gaming is hard to fairly detect, even if you start by looking at a pattern of reviews done by a single individual, or reviews done once by an email that is never used again, etc. None of that will ever be fair—because, for example with Google Places, customers may or may not use Google as their primary email, they may not review often, etc. And seeing a review IP a thousand miles from a reviewed restaurant may just indicate a review after travel. And so on. What makes a lot more sense is looking for patterns of abuse that have to do with relevance of review content. And even that can be misleading. As to IP monitoring, watching a business IP for review creation on-property is also unfair to both the customer and the business. Shouldn’t a customer on the business’ guest wireless be able to review that business? Should the business be forced to purchase tablets on the local cell network just to avoid being “detected” while taking REAL reviews from real customers? And the whole idea that reviews that are asked for are somehow invalid is ridiculous: It’s long-known before the Internet that happy people don’t write letters and unhappy people DO. Modern online reviews are the same way; human psychology hasn’t been so altered on this point by the Internet as to make any difference in the outcome. Businesses have a right to ask happy customers to share their experiences because the business MADE THE EFFORT TO PROVIDE THAT EXPERIENCE. More so, the business has a responsibility to future customers to provide the full spectrum of their experiences. Finally, understand that “gaming for profit” will happen in any review system. Customers have in the past threatened bad reviews (and will again) in order to get their way (or even gain financially) when they should NOT be allowed to do so; businesses will also be approached by 3rd parties who promise “great reviews” from shill customers in return for $. And combos of all that and more will happen. NO MATTER WHAT IS DONE. And the more policing that is done, the more valid reviews will be discounted. And lost. The best path is to remain as neutral as possible and allow the market to do what it will wherever that is possible—and so reviews taken at a business are valid, but maybe reviews of a business that are always 5 star might need a look. However, the real push should be to educate shoppers on what to look for in business reviews so that they can police validity themselves. Because customers started reviews of some kind way back in the annals of time. And they should be able to continue that wherever they want, unfettered, but strongly educated. Ryan, it's fine to disagree. Can we just leave it at that? There is NO sanctity in reviews, no matter where they are done; I've seen review stuffing done, and I've been requested to do it (which I did not and will not do). I won't even teach people, who have asked, how to circumvent DR, etc. "validity" controls. I think, if they buy your service, they can live with the results and pursue better customer experiences. However, if I have a choice, I'm going to trust the dealer who trusts me and focus on their profits every way fairly and ethically that I can. Respectfully, you are straying further from the headline of your post with every reply. Cruel irony, but you are now in the same waters we already discussed here a few months ago that ended in you accusing me of a Red Herring ;) Sorry friend, I see no connection between the title of this post and allusions to "hijacking dealer's fears for profit." The "whole article" to support your position didn't mention a single positive reason to collect reviews in the store and some strong reasons NOT to do it went totally unanswered. I'm not sure what you are standing by. In store collection for most dealers isn't inherently wrong, but it is about dealer convenience and/or control and has some huge potential problem areas to be considered. If the customer isn't just as happy after they leave as they were in the store, you have a problem. If you are more concerned with the quantity of 5 star reviews for marketing purposes or SEO than the quality of those reviews to accurately reflect your business at that time, good or bad, you are only seeing a small piece of a very big picture. I have a lot of respect for you and have appreciated reading your "from the trenches" posts. I wouldn't expect for you to ever agree with everything a consumer driven site does, and I think that's a good thing. I'm glad that we can agree on the topic at hand as it is truly a foundational piece of this puzzle. Ryan, it wasn't a rant. It was blunt and brief and truthful. I presented a whole article WHY, and I stand by it. Keith. the other thread you referred to, I think, was "What To Do About a Bad Review". And the other marketing company illustrates my view. I think we tend to look for the easy way out sometimes. We must earn a good review and ask for the review. We are only discussing the best time to ask here. I prefer, as Rory Vaden says, "Take the Stairs" rather than the escalator. 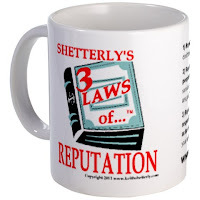 That said, I really like Shetterly's Laws and just ordered that mug. I agree with what you say on it. And that's my point. As for buying at DD, I think I owe you a drink! Scott, I obviously am not sold but I do listen. Who knows, maybe we'll have that lunch we talked about and hash it out one of these days. Ryan, We're on the same side of this issue and I like your analogies. I agree with Keith on some other issues regarding DR but that's a different thread. Great issue here and great comments! Here we go again. I post about something innocuous and you twist it into an anti-DealerRater rant. Is that where you were trying to go from the beginning? I really don't get that so I'm going to take a pass there and try to get us back on target. If you want to start a thread called "I don't like DealerRater because of ______" I'll vigorously defend what we do and why we do it, but I just don't see that as valuable to this community with this topic. Why is it that you feel At-Business Customer Reviews make sense? You haven't made an argument for that strategy and you haven't addressed my reason NOT to do it. At what point in the meal did your server ask you for that review Keith? I'm betting it was right after they presented the check and within moments of your perceived conclusion of business. That is WHY it didn't phase you, business was concluded. Bump that request up to before you get your meal and it seems a little out of place, right? I'll reiterate my point, you must assume the car buyer isn't done with the process in their mind BEFORE they leave the store, and they should be as happy with your efforts 2 weeks after they leave as they were 20 minutes before they got stuffed in F&I. If you can't confidently say that you should be investigating more of your people and process than WHEN you collect a review. You know, the more I think about this, the more I think we need another option . . . kind of like "DealersUnited", except for a review tool and reputation strategy. Hmmmmmmmmmmmmmm. And, for another spot in the record, you can find the following at www.ShetterlysLaws.com. Not a great site, but it's home to this set of items--which were adopted (without attribution to me, I might add!) by a large foreign OEM distributor in the USA. 1) Reputation is advertising. Good or bad, you don't buy it, but you pay for it one way or another. 2) Reputation begins with customer service that people must talk about. If you fail at great customer service and you fail to be talked about positively, you are going to fail at great reputation. 3) Reputation is something you own as far as responsibility, but your customers always own it as far as content--it's what they say, not you, that is your reputation. Ryan, please don't talk about a tip, for goodness sake: Your money, or rather DR's, is banked on just that view of the "sanctity" (cough) of off-site reviews. If there's a real difference between us, it's in the money: Me, I'm just in the business. I don't make a direct dime out of it, either way. DR sure does. DR is not a consumer advocate, by a looonnnnng shot and no amount of words written by you or anyone else will make that so. And, by the way, I've had servers do just that, tell me I can go online to review the restaurant or just use my smartphone right then if I want. Didn't phase me a bit. At-business collection of customer reviews DOESN'T make sense for a reason beyond IP tracking and fraud monitoring... I borrowed this with permission from a dealer on another forum: It's Tacky! I'd add it's largely driven by convenience and/or a desire to control the content! Dealers that are working an in house collection strategy have their eye on the wrong ball. They are trying to control reviews for marketing INSTEAD of controlling the experience of the customer for a good review. There is a gigantic difference between asking a customer to complete a review at their leisure and asking a customer to complete a review RIGHT NOW at the dealership. When was the last time you went to dinner and the server asked for their tip after the salad? What kind of tip would you give them? Ever tip the barber before they spin the chair? Nail salon take you to a back room to write a review while your nails dried? Best Buy ever walk you to the tablet section and ask you to fill out their survey before you go? Ever pay the shoe guy after just the left shoe? Dentist hand you a tablet during the fluoride rinse? Ever get asked to leave ebay feedback before your item arrives? Ever expect to hear your Doctor say "turn your head, cough, and feel free to type a review for me, I'd really appreciate some feedback?" The point is when is the sale completed in the customer's mind? After they talk to the salesman; before they go into F&I; when they get the keys; when they drive off the lot; when they get that follow up call the next day to make sure everything is good? Remember they don't know the process like the back of their hand. If you are asking for the customer to complete a review BEFORE they FEEL the deal is done it's tacky no matter how convenient it is for you. The OEM has it right on this issue with CSI scores, some time must pass before you get REAL data. If all you want is marketing material, write some copy. If you are trying to leverage real reviews, make your efforts center around creating happy customers that will be still be happy AFTER they leave your store. IP tracking and GUID tracking are important considerations, but this is the heart of the issue. I can't think of any other business that does this, can you? Why is the dealership the only place where this kind of "tackiness" passes for a good idea in order to try to control responses? If it wouldn't pass for a $50 dinner we eat 3-5 times a month, how can we expect it to pass for a $50,000 car we buy every 3-5 years?